Last weekend - not this weekend - we had some friends over for a birthday celebration. It was a very world wide web kind of dinner. Jennifer is fan of the apple pie. I usually make her an apple pie. She likes my apple pie. But this year I put this on my Pinterest board. 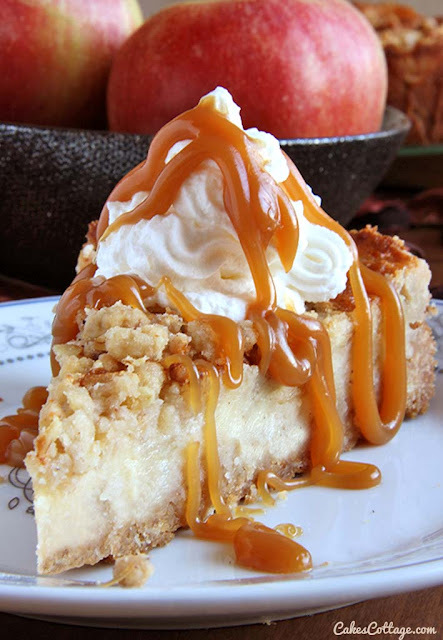 Apple Crisp Cheesecake. I thought it was a worthy candidate. Notice that mine does not look like hers. I don't know how she got her "crisp" to bake up that light. Maybe she augmented the picture with some that hadn't been baked. The recipe was interesting in that the cheesecake recipe did not include eggs or cream - something that is in basically every cheesecake recipe that I've ever made. 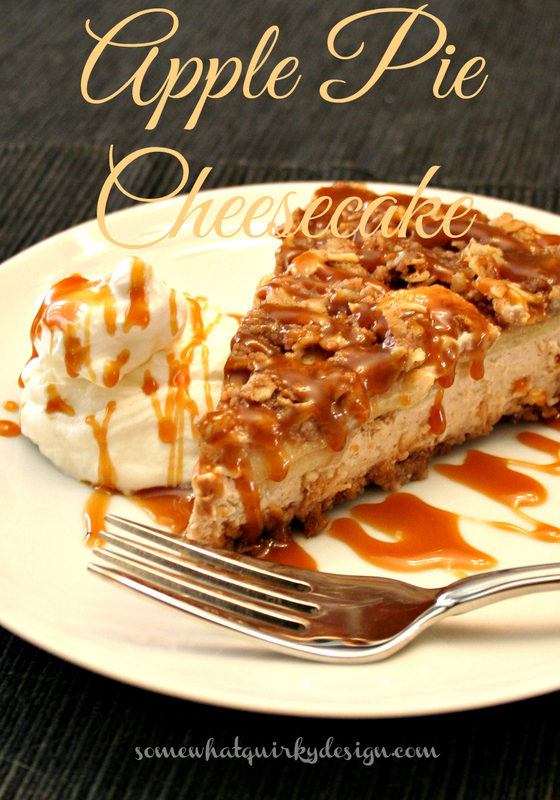 Even though it was pretty tasty I won't make this recipe again, BUT it did give me an idea for a cheesecake that I will make in the future. I will definitely use the crust recipe for cheesecake again - it is wonderful. For dinner we made this . . .
That mound of bacon wrapped, cheese covered, beef is a recipe from the BBQ Pit Boys that was going around facebook that week. Mr. Quirky is a fan of the BBQ Pit Boys. 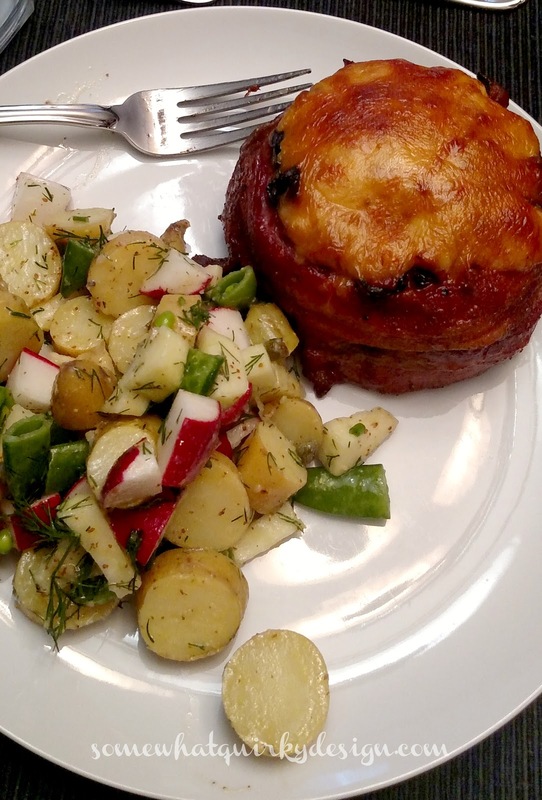 He stalks barbeque sites like I do Pinterest, so he knew about this recipe already. But this was the first time I had seen this video. Which you should watch whether or not you intend to stuff yourself full of meat, cheese, and bacon. When we grill beef at our house we cook on the rare to medium rare side. We actually overcooked these. They still were pretty dang good. We made them again a few days later, to use up the extra beef we had, and cooked them more "accurately" and they were a little juicier than the first time. The other thing we did differently was to put a little bit of cheese underneath the stuffing and then left the cheese off the top until right before we took them off the fire. We did this because that cheese was kind of leathery and we thought they would be better with a soft layer of cheese - and they were. The salad was one of Daphne Oz's that I saw on The Chew somewhere around the same time. I was impressed when I saw it on the show because they served it to kids and they loved it. This is a really healthy and delicious salad that I will make again. It makes a lot. We ate it as a main dish until it was gone. There probably wouldn't have been as much left over if we hadn't been filling up on those HUGE stuffed hamburgers! We all thought it needed a bit more dressing. Make two recipes of dressing. Pour one over the potatoes as soon as you drain them. Pour the other recipe (or part of it) over the veggies and THEN mix everything together. My other advise is to cut all the veggies the same size - and a little smaller than the radishes in my picture - and cut the potatoes a little smaller. If the pieces are too big you can't eat the flavors together in the same bite. And while you might not anticipate that these flavors go together well, they do. You want to be able to eat them together. Oh, and I actually used sugar snap peas instead of snow peas - just because I had them in the fridge, and I like them better than raw snow peas. Anyway, I liked it and will make it again. You can find the recipe and a video here. Hope you've been eating well! I am sure your cheesecake tasted great. Wow, sounds yummy! Love your blog, this is my first time visiting via the intro post in the Haven FB page. Looking forward to meeting you in Atlanta! 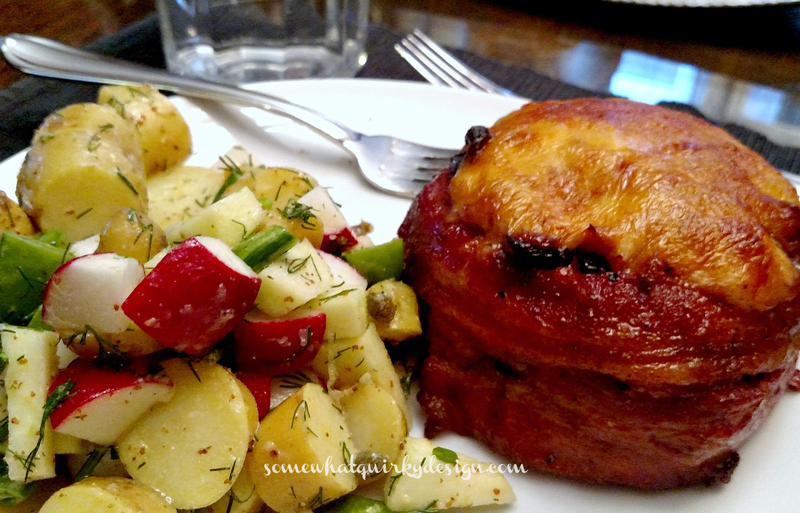 I tried to make that bacon wrapped stuffed burger last week too, but I couldn't find the recipe I had seen so used a different one which was meh. I'll stick with the Pit Boys. And should probably try that salad too huh?